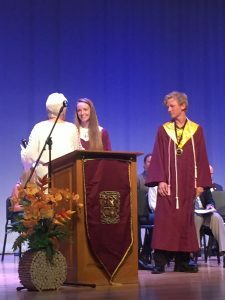 This scholarship will be awarded to two graduating seniors enrolled at the St. Johns County Center of the Arts who plan to major in performing arts at the college level. Two $1,000 scholarships will be awarded annually. Students may download the application on this page. The 2019 Application deadline is passed. The Applicant must be a 2019 – 2020 St Johns County Center of the Arts graduating Senior who plans to pursue post-secondary education in the performing arts. The Applicant must also demonstrate the Six Pillars of Character: Trustworthiness, Respect, Responsibility, Fairness, Caring and Citizenship. The Applicant must have a minimum unweighted overall grade point average of 3.0. Recipients must enroll full time in a post-secondary degree program beginning with the Fall Term of 2020. Application deadline is April 1, 2020. Extra consideration will be given to those who volunteer for the March Celtic Festival and/or the May Festivale of the Arts. © Romanza, All rights reserved. Website created by St. Augustine Web Design in beautiful St. Augustine, FL.